affect their quality of being. when you can do that, lo! the highest art of being already. the esoteric law of mirroring promises this simple spiritual truth: the moments when we become the keeper of a laughing heart, life and everything in our personal universe laugh back at us. the challenge is to sustain those moments and expanding it in whole of life to the extent that it becomes integral element of our being. in far eastern buddhist iconography the archetypal spiritual figure of keeper of a laughing heart is the image of laughing buddha. inside all of us we carry a laughing buddha too. when we become the keeper of a laughing heart, we are already manifesting the laughing buddha within. may your laughing buddha be-come too!
. 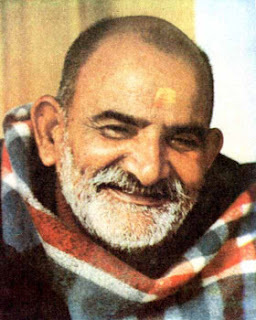 Image of his holiness Neem Karoli Baba, the one who embodied a laughing heart in his whole of being. may God sanctify his soul.